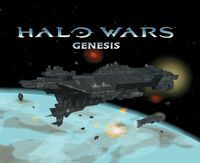 Halo Wars: Genesis is a prequel comic book that details the events leading to Halo Wars. It was included in the Limited Collector's Edition of the game, but has been released digitally on Halo Waypoint for free. It reveals why Admiral Preston Cole made the Cole Protocol and shows what happened to Captain James Cutter, Sergeant John Forge, and Professor Ellen Anders immediately before the game's events. It also reveals more about the past of Ripa 'Moramee and how he came to be the Arbiter. UNSC Battle Group 4 arrives at Harvest in order to investigate an unknown aggression on October the 7th 2525: upon receiving a communication message, already translated by the Covenant to, "Your destruction is the will of the Gods, and we are their instrument", the Vostok and the Arabia are destroyed by an alien vessel. The Heracles retreats. On the planet Reach, ONI brass compare the event with the Battle of Chi Ceti and ask a retired Vice Admiral Preston Cole to command a force to retake Harvest. He and his fleet arrive at Harvest on the 1st of March 2526, just to find the same ship which destroyed the two frigates a few months earlier. The UNSC ships succeeded in defeating the Covenant vessel, but lost ships in the process. 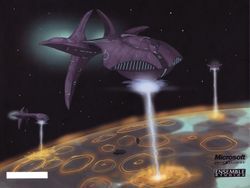 Mass media are ordered to keep events regarding the Covenant secret and replace the battle information with that of a communications satellite captured by Insurgents, whom Cole was sent for; the colonies of Second Base and Green Hills are reported as Insurgent bases but were actually glassed. Also the loss of Chi Ceti IV is kept secret. Due to the impossibility of keeping the offensive a secret, the news about Cole now commanding the whole UNSC Fleet goes public and he continues to fight the Covenant throughout the Outer Colonies until 2531. Several battles, including those occurring at the Origami Asteroid Field and that of XI Boötis A System are more losses than victories: UNSC forces are decimated just to defeat a few enemy vessels. At the Battle of Groombridge-1830, another Pyrrhic victory, Cole learns of the Covenant's resoluteness by a Sangheili survivor and decides to create the Cole Protocol. January 3, 2531: UNSC Spirit of Fire is sent to Harvest to assist the crippled UNSC Prophecy. Before making the jump to the colony world Captain James Gregory Cutter inspects the Shaw-Fujikawa Translight Engine and the drop bay of the ship, while his history is told during the travel. As the ship arrives near the Prophecy, Serina hypothesizes the only reason ONI knew about the crippled ship so fast is they were there when the misdeed occurred. Cutter orders the Prophecy's Nav Database and survivors to be recovered: Fire Teams Echo, India, Lima and November's Pelicans take off while the Spirit of Fire engages 4 Covenant vessels. Sgt. John Forge's Pelican takes off as well and heads to the Prophecy but is hit by a Phantom and crash-lands upon the Prophecy hull. Forge and other EVA Marines breach and enter inside the Prophecy where they are attacked by Jackal Rangers. Forge breaks his ankle during combat, but, with Serina's aid, is then able to find the ship's Terminal 4 to recover the ship's Black box and wipe its Nav Core, while the rest of Team Lima rescue the survivors. Serina warns Forge that the Prophecy 's A.I. may "act peculiar" due to high radiation levels, and so happens: upon scanning his retina to gain access to the terminal, Forge is halted by FitzGibbon, who explains he cannot allow him to enter due to his CSV. Forge tells the A.I. he's there to ensure Cole Protocol not to be violated, and the latter lets him in the terminal room enabling radiation repair routines. Forge purges the Nav Database and heads back to the Pelicans as FitzGibbon activates the Prophecy's self-destruct sequence which destroys the ship. After the marines and Forge escape with survivors, they are taken to the med bay of the Spirit of Fire, where Forge is told that there are no survivors, and that they took too much radiation when aboard the Prophecy to survive. Soon after, Ellen Anders is leaving a scientific presentation on Arcadia about unknown artifacts found on various planets such as Onyx, (despite Onyx being a classified secret) when she is kidnapped by ONI. She is shown all of ONI's images of what appears to be a Covenant leader, which turns out to be the Arbiter. She is then sent by ONI to Harvest on the UNSC Last Gleaming, where she joined up with the Spirit of Fire, and shows Captain Cutter everything she's learned about the Arbiter on the way. A Warlord Thrall named Ripa 'Moramee had the honor of putting down the Sixteenth Unggoy Disobedience, the heretical reign of the Kig-yar Pirate Prince and showed a fondness of brutality. He soon developed a desire for greatness, and attempted a coup on his own clan leader, and failed. He then is sentenced to imprisonment. He escapes almost instantaneously, but is caught and captured by the Prophet of Regret. Regret questions 'Moramee, before deciding that he will become the seventeenth Arbiter in the line of Immaculate Succession. Back on the Spirit of Fire, Anders and the captain discuss about the arctic region. Cutter sends Forge to assemble a team and investigate, saying they may now be able to find out why the Covenant want Harvest. In the flash transmission sent by AI Endless Summer to Kurt-051 after the initial sighting of the sentinels on Onyx, attached file #3 says that all data pertaining to Onyx has been classified. This file is dated on January 3, 2511. However, sometime in 2531, just before ONI kidnaps Ellen Anders, she is depicted as giving a public presentation at Rishard University in a classroom. The material presented involves Onyx, which she mentions by name.